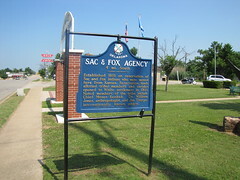 Sac & Fox Agency. 4 mi. South. 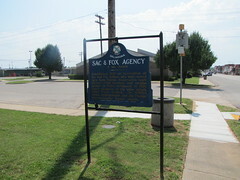 Established 1869 on reservation of Sac and Fox Indians who where moved here from Kansas. 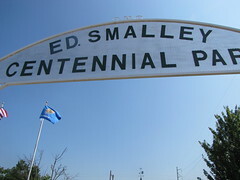 Reservation lands allotted tribal members and surplus opened to White settlement in 1891. 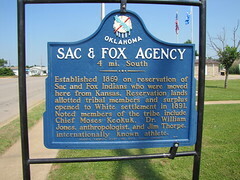 Noted members of the tribe include Chief Moses Keokuk. Dr. William Jones, anthropologist, and Jim Thorpe, internationally known athlete.